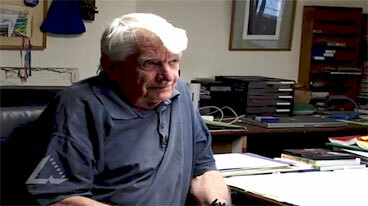 Video clip synopsis – Bruce Petty investigates the effects of political satire and cartooning. Broadband MP4 bpetty1_bb.mp4 (8.2MB), suitable for iPods and computer downloads. Talkback Classroom is a forum program run by the Education section of the National Museum of Australia. Each year, panels of three secondary students selected from schools Australia-wide interview leading decision makers on important current issues. The panels participate in a ‘learning journey’ (researching the issues and developing interview skills) to explore the issues and prepare for the forum. In 2007 a forum on the topic of ‘Political Satire’ was held. The guests interviewed were John Safran, SBS TV/Triple J radio presenter and Canberra-based cartoonist David Pope. The interview panellists were ACT students Kirrily Howarth (Yr 12 St Francis Xavier College), Samantha Bobba (Yr 10 Lyneham High School) and Wil Francis (Yr 9 Belconnen High School). In preparation for the forum, students participated in a learning journey that involved interviewing Australian cartooning icon Bruce Petty and Joe Hockey, Shadow Minister for Health and Ageing. Australia has a rich political history. A significant part of this history is political satire; this allows society to see the ‘underbelly’ of the political process and to gain insights into governmental behaviour and decision making. Over a period of two weeks, collect examples of political cartooning from newspapers and on-line sources. Analyse the range of current affairs that forms the subject matter of the cartoons. Look for any patterns in the subject matter i.e. some being emphasised more than others. Compare any cartoons that address the same topics; discuss them in regard to which may be more effective in commenting upon those topics. Try to establish what might make some cartoons more effective than others that are on the same topic. Bruce Petty refers to an incident in which an Australian cartoonist living in another country was expelled from that country after he produced a cartoon that featured the country’s Prime Minister. Make a note of the name of the cartoonist and the country involved so that you can research the incident later on. Expand your research to include any other examples in which a cartoonist has caused a major upset by producing a possibly contentious cartoon. Look for reasons (cultural, political etc.) as to why the cartoon caused problems. Discuss in class the effect of the cartoon(s) and consider the range of opinions in your class. Stage a class debate on the topic of ‘Cartoonists shouldn’t stick their noses into politics’.